Ley lines (often known more simply as Leys) are the most enduring and well known of the New Age archaeological beliefs. Leys are supposed to be alignments that stretch across the landscape (generally that of Great Britain, although other places are said to possess them), they thought to have been established in the distant past by prehistoric people. They are usually identified by so-called ‘ley-hunters’ using maps showing ancient sites, churches, crossroads and so on located along a straight line that can range from one or two to many kilometres in length. Most ley lines are identified simply by an aligned placing of marker sites, but some are supposed to be marked by straight tracks along part of their alignment. 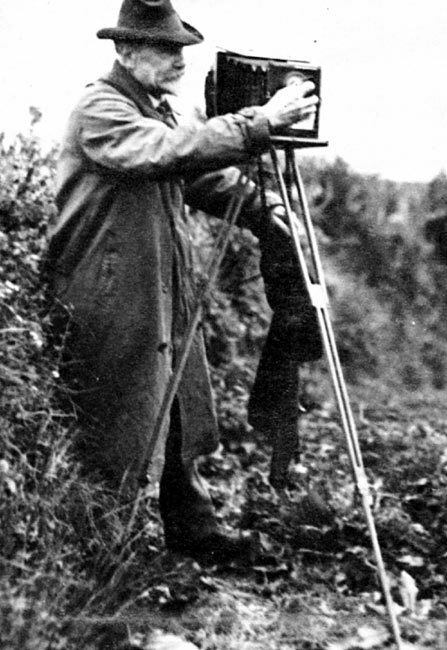 The idea of ley lines came to Alfred Watkins, a locally well-known Herefordshire businessman and amateur archaeologist, on 30 June 1921. He was looking for features of interest on a map of the Blackwardine area when he spotted a straight alignment passing through various ancient sites and churches. He later claimed that he saw “in a flash” a whole pattern of lines stretching across the landscape, although he had no underlying theory for their function, whilst out riding near Bredwardine in 1920. After this sudden revelation, Watkins gradually became convinced that these ley lines were the remnants of Neolithic trading routes. His first publication, Early British Trackways, Moats, Mounds, Camps, and Sites in 1922, did not receive much attention. The next book, though, created a minor storm of controversy, although not for the right reasons. …imagine a fairy chain stretched from mountain peak to mountain peak, as far as the eye could reach, and paid out until it touched the “high places” of the earth at a number of ridges, banks, and knowls. Then visualize a mound, circular earthwork, or clump of trees, planted on these high points, and in low points in the valley other mounds ringed round with water to be seen from a distance. Then great standing stones brought to mark the way at intervals, and on a bank leading up to a mountain ridge or down to a ford the track cut deep so as to form a guiding notch on the skyline as you come up. In a bwlch or mountain pass the road cut deeply at the highest place straight through the ridge to show as a notch afar off. Here and there, at two ends of the way, a beacon fire used to lay out the track. With ponds dug on the line, or streams banked up into “flashes” to form reflecting points on the beacon track so that it might be checked when at least once a year the beacon was fired on the traditional day. All these works exactly on the sighting line. The wayfarer’s instructions are still deeply rooted in the peasant mind to-day, when he tells you—quite wrongly now— “You just keep straight on”. The writing was visionary and compelling, offering a new dimension to the prehistoric past that locked it firmly into the present day. Gone were the then-popular waves of invaders, constantly reinventing the British landscape; in Watkins’ vision, this ancient web still exists, albeit in fragments, and we live our lives unknowing in its midst. As a network, though, it was a purely practical one: it enabled Neolithic traders to move around Britain, exchanging their goods in return for sustenance. His ideas soon attracted followers, who were able to identify ley lines everywhere in Britain. Watkins tried to use a mathematical proof to show that the distribution of the key points along the ley lines he identified could not have been a result of chance, Correctly believing that the more points found to lie on a single line on a map would improve the credibility of the alignment. Their interpretation as prehistoric routes was as far as Watkins was prepared to go, despite the fact that numerous ley lines travelled across prohibitively steep hillsides, across rivers at points that cannot be forded and through the middle of bogs. He was convinced that his mathematics showed that too many lines with four or more markers could be identified than would be predicted by chance. The archaeological community was unimpressed, though. The prestigious, recently founded journal Antiquity refused to carry an advertisement for the book, treating it as beneath the dignity of the publication. In retrospect, this was a mistake, as it has allowed believers in ley lines to accuse the editor, Osbert Guy Stanhope Crawford (1886-1958), of censorship and attempting to stifle debate about new theories. However, Crawford’s reasons were straightforward: for ley lines to be acceptable to the archaeological community as prehistoric trackways, Watkins would need to demonstrate that either the alignments could be shown to be genuinely ancient by archaeological means or that the markers along their lengths were similarly ancient. This was something that Watkins had not done and never did. While some markers, such as standing stones, were genuinely prehistoric, the majority were not. Instead, he speculated that most medieval churches were built on sites that had been sacred in prehistory, that lanes in the countryside have run on the same course for millennia and that straight lengths of Roman road adapted these earlier tracks. This was not good enough to convince archaeologists who wanted to see evidence they could recognise. Speculation about the meaning and purpose of ley lines continued after Watkins’s death in 1935. His leys were too different from what was acceptable to the mainstream to be allowed to keep their original, all-too-mundane purpose as mere trackways. A start was made in 1936 by the occultist Dion Fortune (Violet Mary Firth, 1890-1946), whose novel The Goat-Foot God put forward the idea that ley lines were ‘lines of power’ linking prehistoric sites, although she neglected to specify what sorts of ‘powers’ might be involved. After the Second World War, Guy Underwood (1883-1964) believed that nodes in the system – places where two or more ley lines meet or cross – could be detected by dowsing. Indeed, he believed that dowsing revealed buried lines of energy that could explain the layout of Stonehenge, including why some stones were not upright, the design of the Uffington White Horse and other well known ancient sites, right through to medieval cathedrals. The scene was thus set for the elevation of ancient trackways to something more spiritual. Why have the armchair experts decided that ley lines are straight – they are doing themselves and the recovery of this knowledge a grave dis-service. I have followed the ley lines here in Scotland ON FOOT for over 3,000 miles – some are roughly circular, (BOUNDED BY STRAIGHT LEYS ACTING AS MAGNETIC BOTTLES. Hamish Miller also found that they were not straight, the St. Michael/Mary line intertwines. It is an unassailable fact that many (or all) of the ancient burial grounds in my area (Crieff, Perthshire) have been carefully placed on these lines, as well as ABOVE VOLCANIC ANOMALIES,like the Highland Boundary Fault – they buried their dead on these faults and constructed a ley line to pass through it. Our ancestors who constructed this remarkable system were not in the least interested if a ley was straight, so why should we be? Seems the lack of credible evidence (as in beyond Mr. Watkins speculation) puts the ley thing to rest. The burden lies with those making the extraordinary claim to produce some actual, tangible evidence for such a claim. On the other hand, dowsing can actually work to some extant. I know this for a fact because in the construction industry I have first seen it demonstrated and then learned to dowse in order to locate buried utility (electric, gas and and water) lines in order to avoid disturbing them. This dowsing method uses metal welding or brazing rods bent 90° and held very loosely. I use plastic bic (biro?) pen tubes as holders with thumbs barely in contact with the rods at the bend to avoid them moving as a result of just walking. When the dowser passes over power and plumbing lines the rods are deflected. I don’t attribute this to any spiritual or mystical influence but rather electrical induction as even the friction of water flowing through an iron pipe generates a small amount of static electricity and I believe the deflection of the rods is due to the electro-magnetic field caused by the electrical current in the buried cables and pipes. I have no clue as to how dowsing could possibly work with wooden dowsing rods as claimed by those who use them for finding water sources. My educational and work background includes: certifications in advanced electronics technology, bio-medical electronic technology, US Navy Radar School, commercial construction diving, Marine Electrical and Mechanical Engineering, Pile Driving/Building Construction Foundations. I have not dowsed to find underground utility lines in years so I forgot to mention that I removed the welding flux from the rods & made sure they were clean. There was also a difference in how well bronze brazing and steel rods worked. Can’t remember which worked better. It was easy to define a straight line between “landmarks” provided one could count out landmarks out of the line and count in anything on the line as a landmark, but if the lines are not even straight there must indeed be a lot of them all over the place. I have a fascination for Leys and dowsing in general. I fully agree with the theory that Leys are energy lines that ancient peoples tappped into and harnesses for various good/not so good reasons. My latest book “Ley Lines UK and USA” shows conclusively that our ancestors built their major churches, cathedrals, palaces, abbeys, Irish round towers and many other sacred sites between volcanic plugs. Edinburgh has a ine of them: North Berwick law, Calton Hill and down to the south-west the Irish Giant’s Causeway. There are NINE major banks on this ley, with the Speculative Society of Freemasons and St. Andrews Square, which has its paths in the shape of the all-seeing eye of the Freemasons. this was planned only ten years ago.